After the fall of Socialist Yugoslavia, this monument to national heroes from Topola region was damaged and after that just fell into oblivion. The local residents have no idea what it represents, despite its prominent location in the town of Topola. The monument to the “National Heroes” from Topola and its vicinity (namely Milić Radovanović, Milan Blagojević, Darinka Radović and Sofija Ristić) was opened in 1975 on Oplenac Hill in Topola, next door to the park surrounding the Royal Mausoleum of the House of Karadjordjević. The monument was opened together with the small Museum of the National War of Liberation, situated in the so-called Vineyard Keeper’s House, previously part of the mausoleum complex. The massive stone heads of two men and two women seem to be emerging from the land itself– giants, coming out from the soil that bred them. Their undoing was their location. Being next door to the complex of the Royal Mausoleum meant that, with the fall of communism, they were seen by many as “intruders” on this “sacred ground”. In the early 1990s, when the anti-communist sentiment ran high, the monument was damaged, uncared for, almost forgotten–both by local authorities and the locals. The reasons are twofold: first, the monument did not have any inscription on or next to it (or, if it had, that description was destroyed long time ago? ); second, this forgetting was the result of a process of pushing aside of all memories connected with communism. 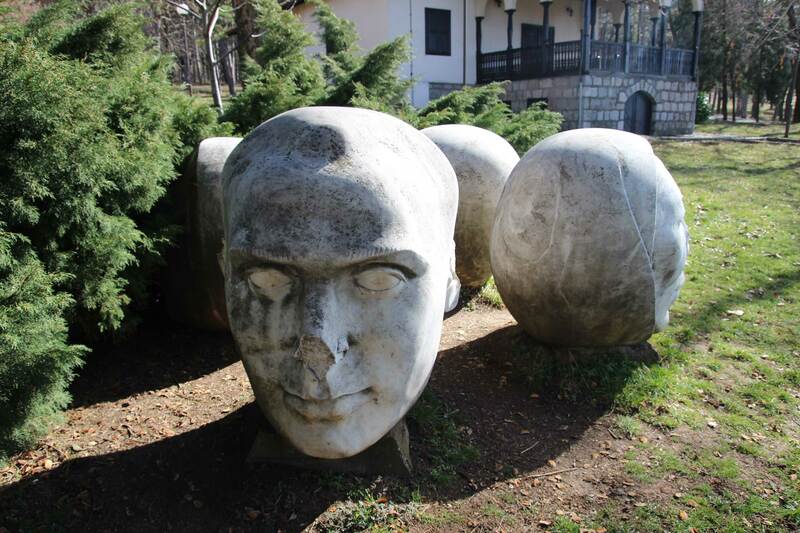 Thus the “Four Heads” monument fell into almost total oblivion, so much so that the residents of Topola–though aware of its existence, since it lies on their favourite promenade–have no idea what it represents. The other communist monument that stands next to it, since it clearly states what it represents, is much more recognised. The monument is slightly damaged and partially obscured by bushes and greenery; the face of one of the heads cannot be seen at all. The monument is not listed as a heritage site. VD: Jelena, do you, as someone who went to school here and, as they say, lived your whole life here, do you know these two monuments? Apart from the fact that they’re from socialist times and dedicated to some National Liberation fighters. 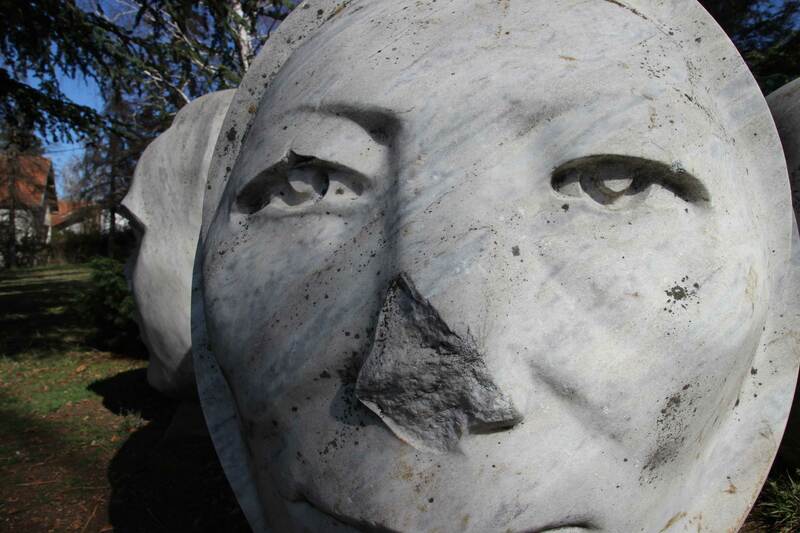 Do you and your fellow citizens know who these monuments were actually dedicated to? VD: As far as I know they are some national heroes from Topola? JĐ: Yes, national heroes, some Partizans… And this second one I don’t rightly know who it’s dedicated to. VD: And this, let’s say, second one, is in good condition. But these heads have been pretty neglected, damaged and they’re hidden from view. JĐ: Someone damaged them. So, someone came along and damaged them. Why – I don’t know. Probably in revolt or protest or whatever, because it represented communism. VD: And do you remember, I couldn’t find that anywhere, not even an old photograph, I just read that it was damaged at the beginning of the 90s but I don’t if they were once on a plinth or something or were they always like this? JĐ: They were always like this. VD: Always like this? Ok. And what do you think, if tomorrow the monument was gone, if it simply vanished, if someone removed it, to move it elsewhere, would anyone in Topola care? JĐ: Well, I wouldn’t miss it. I don’t care. Have I got used to them? Well I pass by like I do by anything else. And those images simply don’t represent anything from that time. I don’t care. Maybe it would be better to put up something about the kings, considering this is Topola. The Kaređorđević dynasty, kings and so on… Personally, it would be better for something to represent the kingdom. VD: And do you think that these monuments were put up here to compete with the church in a way? VD: Are there any other, larger monuments in the area, to some Partizan units or something like that? JĐ: No. I think that’s all there is. VD: So, these are the two main monuments? JĐ: Well, I don’t think there are any more Partizan monuments. Up there it’s all to do with the church, the Karađorđevićs and the rest. Only these one here represent something, to put it like that. VD: Do any people come from the SUBOR organisation, some veterans? Do they ever lay wreaths here or anything like that? JĐ: I do sometimes see them there. Who puts them there, I don’t know. Probably someone who, what do I know, who it means something to. JĐ: I think so, yes. Basically, our lot from Topola, I don’t know if we’ve got used to it. For example, our Oplenac Church up there, it’s like it’s in our back garden and doesn’t mean all that much like it does to people who come from somewhere else. Because for people who come to visit, it’s the Oplenac Church, the Karađorđevićs, kinds, dynasties, all that… For us I suppose it’s more like we’re used to it, so we go to Oplenac for a little walk and not to see the church. For a while Tomislav Karađorđević was here and we could see him like you and I are talking right now and talk with him and that was to begin with like, “Wow, I’m talking to a Karađorđević” but then it became ordinary. 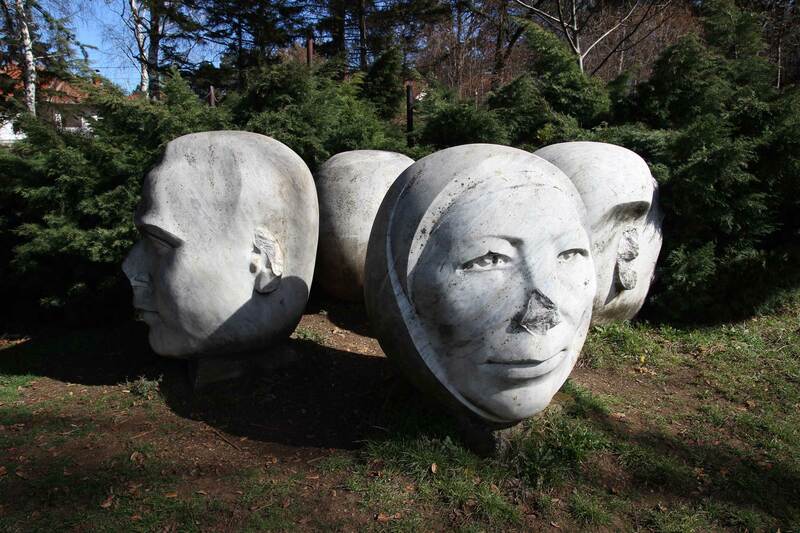 VD: Marija, tell me, because you live here in Topola, how do you and others from Topola see this monument, these four heads? Do people know what it means, what it’s a monument of, why it’s here? MO: Here, as far as I know, its part of what’s put on offer by the Foundation for tourists. If a tourist comes to our parts, I think they can buy a ticket and visit five sites. What I do know is that this vineyard house is part of the visitor complex and the curator says something about the history and what these monuments are for. What I can say is these monuments only mean something to the older generations – to the younger ones they don’t mean anything. VD: Yes, because there actually isn’t anything written there saying what it is so definitely those who haven’t been paying attention can hardly know. MO: They’re some local people’s heroes. VD: But there are two monuments. There’s this one, to the Mothers of Šumadija and there’s this one to people’s heroes. Mothers of Šumadija has a plaque and seems… You knew a minute ago what that monument is? MO: Of course. We even worked in a school that’s also close to Topola, some ten kilometres away and is called The Radović Sisters who were from those parts and the schools got their names from those people’s heroes. Even the school where I work now was named after a local hero. VD: And what do you think, because the two monuments are next to one another. It seems most people know what the left one is, Mothers of Šumadija, then the sisters – what did you say – Radović. But this other onw practically nobody knows. Do you think that’s just because it’s a bit more abstract, in the sense that it’s just heads and there’s no definite plaque or is it something else? MO: I have no idea, honestly. VD: And tell me, do you think that if someone removed this pretty anonymous monument, if it vanished – and it’s already half overgrown – would anyone miss it? Do you think people have any feelings about that monument? MO: Well, since younger generations are coming, unfortunately, soon they won’t even know anything about local history, I their future will not be guaranteed. VD: And considerring that we’re in a pretty busy spot, even today there are quite a few visitors and quite a few foreign tourists come here to look around, do you think a small renovation of that monument, would that be a good thing? What do you think should be done with it? Move it somewhere else? MO: Well, let’s say, for our Topola, what do I know, maybe they could be grouped somewhere with similar monuments, in one place, let’s say. Or if they’re dedicated to those heroes from that area, maybe move them there. If that’s their hallmark, if they’re like Darinka Radović, the mother, and her two daughters, move them to where they were from. Maybe move them up there to the park, like in Bukovička banja, in Aranđelovac. There a whole park is covered in those monuments.